Kanyakumari, also called Cape Comorin during the British rule of India, is a small coastal town in Tamil Nadu near the Kerala border. It's renowned for being the southernmost point of India where the Indian Ocean, Arabian Sea and Bay of Bengal all meet. However, the town also has special spiritual significance. It's regarded as the abode of virgin Goddess Kanya Kumari, an incarnation of Goddess Parvati (the divine Mother Goddess). Goddess Kanya Kumari is believed to have done penance there to get Lord Shiva to marry her. Hence, the town is a popular pilgrim destination for devotees who come to bathe in its holy salt water and make offerings at its temple. Here are the top things to do in Kanyakumari, including some offbeat side trips. Revered Indian poet and philosopher Swami Vivekananda visited Kanyakumari in 1892, towards the end of an extensive trip across India. His transformation into an influential leader and reformer is attributed to the three days he spent meditating on a large offshore rock, where Goddess Kanya Kumari is said to have carried out part of her penance by standing on one foot. (According to ancient Hindu texts, the Puranas, the rock was blessed by the touch of her foot). A memorial was built on the rock in 1970 to honor Swami Vivekananda. It consists of a pavilion with a life-size bronze statue of the Swami, a hall with information about his life, and a meditation area. There's also a carving of the Goddess's foot on the rock. To get there, take a 15-minute ferry ride from Kanyakumari beach. The service operates from 8 a.m. to 4.30 p.m. (or 7 a.m. to 5.30 p.m. depending on the time of year). Buy a premium ticket, costing 169 rupees, to avoid waiting in the ticket line for up to two hours during peak times. A towering statue of the great Tamil poet and philosopher Thiruvalluvar stands on a smaller neighboring rock, just off the coast of Kanyakumari. The foundation stone was laid in 1979 and the work was completed 20 years later, in 1999. Ferries to Vivekananda Rock Memorial stop at the Thiruvalluvar statue afterwards if the tide permits. It's possible to go inside the base of the statue, and climb the stairs up to its feet for a superb view, as long as it's not closed for periodic maintenance. The remarkable spot where the oceans merge, known as Triveni Sangam, is considered to be powerful and sacred. A dip in the water will wash away all sins and provide liberation from the cycle of rebirth. Even if you don't want to participate in the ritual, it's still worth spending some time at this unique place and contemplating its essence. Depending on the tide and weather, you may even be able to distinguish the oceans from each other, based on variations in their shades of blue. 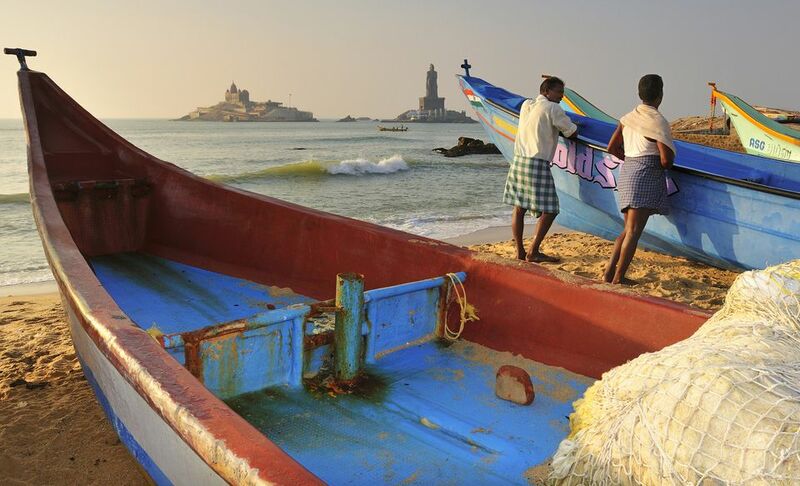 Priceless sunrises and sunsets, on Kanyakumari's liquid horizon, are among the finest in India. Sunrise, alongside the Thiruvalluvar statue, is arguably the most majestic of the two. However, sunsets are particularly special on full moon nights, when the moon rises from the sea opposite the setting sun at about the same time. The following morning, it's possible to see the sun rising and full moon setting together. Sunsets into the sea are best viewed from the beach during December to February (and are only really visible from there between mid October and mid March). Be prepared to join the crowd! It really swells on Chitra Purnima (the auspicious full moon in April). For an alternative, year-round, panoramic view of the sunrise and sunset head to Murugan Kundram on a nearby hill. Or, if you don't feel like getting up early, enjoy the sunrise from the comfort of your bed at the Sea View Hotel or Seashore Hotel. The town's 3,000-year-old Kumari Amman Temple (also known as Arulmigu Bhagavathy Amman Temple) is dedicated to Goddess Kanya Kumari, who is worshiped as a great protector after destroying mighty demon king Banasura. This important temple sits by the sea near Triveni Sangam and has a beautiful black stone idol of the goddess. The standout feature is her sparkling bejeweled nose ring. Non-Hindus can enter the temple. It's open from 4.30 a.m. to noon, and 4 p.m. to 8 p.m. Do note that photography is prohibited, bags must be left outside, and men must remove their shirts before going into the inner sanctum (where the idol is). You can purchase a ticket for 20 rupees to avoid lining up. The Navratri festival in October is a major celebration at the temple. Mahatma Gandhi visited Kanyakumari a couple of times too, and some of his ashes were scattered into the sea there on February 12, 1948. A memorial was later constructed at the location where the ashes were kept for public viewing, near Kumari Amman Temple. Its architecture resembles that of temples in Odisha and the design is quite exceptional. At noon on October 2, Mahatma Gandhi's birthday, the sun's rays fall through a hole in the temple's roof and onto the place where the ashes sat in an urn. Shells, painted shells, handicrafts made from shells, and products decorated with shells dominate the souvenir selection at Kanyakumari. They're sold everywhere and collectors will love them! You can even get a customized shell with your name engraved on it. Vendors line the seafront walkway with an array of colossal shells. You'll find more in the shops on atmospheric Sannathi Street (the main market area) leading to Kumari Amman Temple. This market has shops selling lovely woven handloom saris as well. About an hour northwest of Kanyakumari, the town of Padmanabhapuram is a popular day trip with regal heritage. It was once the capital of the princely state of Travancore, before the king relocated the capital to Trivandrum (now the capital of Kerala) in 1795. The main attraction is Padmanabhapuram Palace, which dates back to 1600. Don't expect a typical lavish palace though, or you'll be disappointed. However, the palace is apparently the largest wooden one in Asia. Its craftsmanship and architecture are admirable, especially the detailed woodwork on the walls and ceilings. The palace complex is spread over more than six acres within a fort. It also has a museum. Take National Highway 66 to Padmanabhapuram, and you'll be able to stop at Thanumalayan Temple in Suchindram on the way. Its one of the rare temples in India where Brahma, Vishnu and Shiva are worshiped as a trinity. You probably wouldn't expect one of Asia's largest wholesale flower markets to be in a village 30 minutes north of Kanyakumari. The area around Thovalai specializes in growing flowers, particularly an unusual variety of jasmine, and the market there brims with piles of scented buds. Vibrant roses and marigolds add to the colorful spectacle. Get there early through. The market opens before sunrise and concludes by around 10 a.m. Interested in renewable energy? A trip to Thovalai flower market can be combined with a drive through Muppandal Wind Farm by continuing about 15 minutes further along National Highway 944. Notably, it's one of the largest onshore wind farms in the world, and India's biggest source of wind energy. Its motley assembly of turbines stretches for miles, curiously intermingled with palm trees and banana plants. The fact that the turbines are sponsored and commissioned by private companies accounts for the lack of uniformity in their design. The much-anticipated southwest monsoon arrives on the Indian mainland by early June each year, and the southernmost point at Kanyakumari is where it hits first. Feeling the energy of the storm rolling in, while looking out to sea at it, is an extraordinary experience. Monsoon chasers can follow the rain all the way up the western coast of India.